Another Olympic Waterfall | Just Shooting Memories! Many cities walk a fine line between development and maintaining green space and parks. Atlanta falls into that category and includes several large parks. 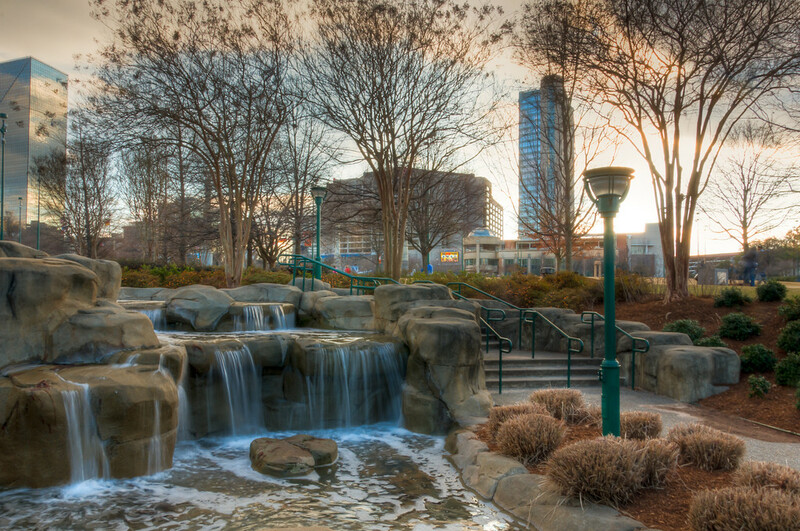 Centennial Olympic Park is one of those parks. It is a gem of peacefulness amidst the bustle of one of the busiest cities in the world. My favorite part is not the fountain in the shape of the Olympic Rings, the many monuments or the vast open area to just lay around or have fun, although all of those are nice. My favorite part of the park happens to be the flowing creek along the eastern edge of the park. The babbling of the brook seems to make the sounds of downtown melt away and the waterfalls make for an interesting view.